When the 190 was first presented in December 1982, it didn’t look particularly revolutionary. 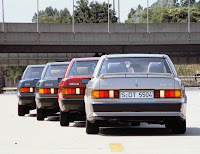 Yet the Mercedes-Benz mid-size Saloon, designated internally as the “compact class” and positioned below the E-Class, S-Class and SL-Class, became a milestone for the future development of the Mercedes-Benz model portfolio. Its strong, clear lines matched its product claim as a genuine Mercedes-Benz, an embodiment of progress, about to step out into a new car category. With its clearly defined wedge shape and finely chiselled light-catching contours, there was nothing reticent about the new model series, proudly taking its place in the Mercedes-Benz family. The man responsible for the fresh linear design was Bruno Sacco. 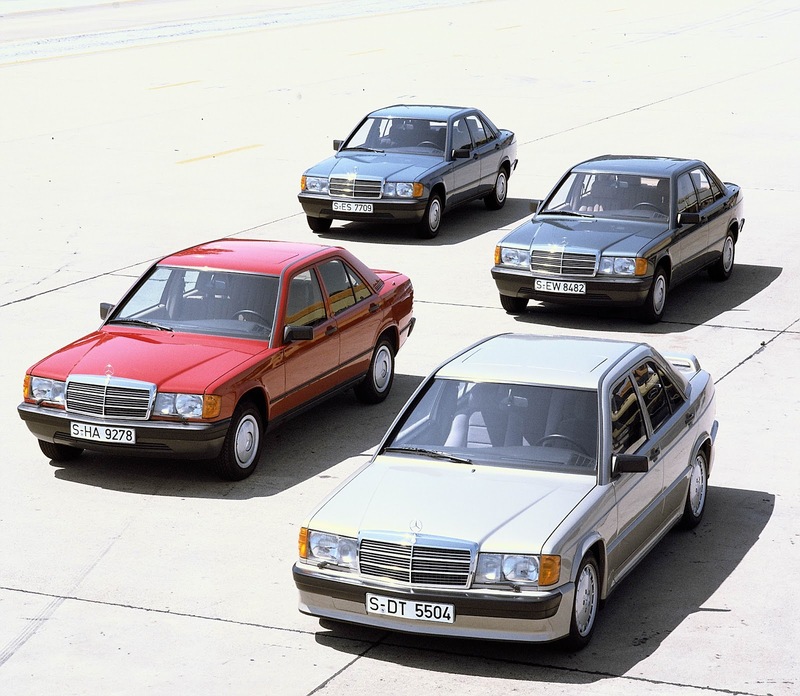 The first models in the W 201 series were the 190 and 190 E which quickly became a major success and role models. As well as providing the basis for subsequent C-Class generations, the 190 Saloon, known affectionately as the Baby Benz, also became the first shot in Mercedes-Benz’s product drive. The Mercedes-Benz compact class – or C-Class as it became known as from the subsequent W 202 series, according to the nomenclature introduced at the time – clearly aimed to replicate the virtues of its bigger relations in terms of handling, passive safety and reliability. Along with its smaller size, the new Mercedes-Benz was also lighter and very economical. To reduce fuel consumption, the Mercedes-Benz engineers optimized the aerodynamics of the body and also used high-strength sheet steel and other innovative materials to reduce the weight of the car. As a result, the 190 weighed just 1180 kilograms, without any reductions in passive safety. One of the features providing passive safety commensurate with the S-Class Saloons was the forked-member structure of the front end. This design, taken from the S-Class from the 126 series, ensured that the 190 also met the requirement for an asymmetrical frontal collision at 55 km/h with 40 percent overlap. The 190 model also had a revolutionary new chassis design, developed specifically for the new model, which proved a great success. The main feature was the multi-link independent rear suspension. Each of the rear wheels was located by five independent links for optimum wheel control, with lateral and longitudinal forces effectively balanced in all driving situations. This improved steering precision and ensured very well-behaved handling characteristics. The new rear axle design was also lighter and more compact than its predecessors. The front axle featured shock-absorber struts located by individual triangular wishbones and anti-dive control. This gave the W 201 excellent straight-line stability, and being a relatively flat structure it also left a lot of space under the hood. These chassis innovations delivered their benefits only once the car was on the road, but there were some other surprises in store for Mercedes-Benz drivers used to the S-Class and mid-series as soon as they entered the car. Instead of having a foot-operated parking brake, as used in all Mercedes-Benz passenger models made in Stuttgart from 1968, the W 201 model series had a conventional parking brake, operated by means of a lever between the front seats. The engineers saw this as a way of saving space in the foot well, and in any event, little effort was required for applying the parking brake in the compact class car because of the latter’s lighter weight. The 190 was built in Sindelfingen and Bremen. Production began in Sindelfingen, with the assembly line in the Bremen factory starting up later, in November 1983. The plant had had to be modernized for production of the Mercedes-Benz compact class in a long and expensive process. The mid-series Estate (S 123) had been manufactured in Bremen from early 1978. Production of the new compact class was organized as a joint operation between the two locations – the first time in the company’s history that such an arrangement was used to this extent. One of the routine requirements for this cooperation at a distance of several hundred miles was the exchange of body components. For example, Bremen produced the engine hoods, floor assemblies, fuel tanks and doors, while all other sheet metal components came from Sindelfingen. Along with this interchange of components between the two locations, engines, transmissions, and axles were shipped to both plants from Untertürkheim, and the steering gear assemblies were sourced from Düsseldorf. Mercedes-Benz started production of the 190 and 190 E models in 1982; the 190 D and 190 E 2.3-16 followed in 1983 and 1984, respectively. The first two models, both petrol-powered, were fitted with four-cylinder engines with a displacement of 1,997 cubic centimetres, delivering 66 kW (90 hp) and 90 kW (122 hp), respectively. The units from the M 102 family of engines were based on the engine used in the Mercedes-Benz 200 (W 123) introduced in 1980. For the 190, engine power was trimmed back from 80 kW (109 hp) to 66 kW (90 hp) by reducing the size of the intake and exhaust ducts and fitting a modified camshaft and smaller valves. At 90 kW (122 hp), the engine of the 190 E delivered significantly more power thanks to petrol injection. This was the first time the Mercedes-Benz engineers used the mechanical electronically-controlled Bosch KE-Jetronic injection system, giving the compact 190 E a top speed of up to 195 km/h, and “Mercedes-style spiritedness,” as the 1982 brochure put it. Just one year later, the 190 D came along with a completely newly developed four-cylinder diesel engine with a displacement of 1997 cc – a configuration that intrigued people. With its exemplary encapsulation, this engine prepared the ground for state-of-the-art diesel technology in Mercedes-Benz passenger cars. Known as the “whisper diesel,” the engine emitted only half the noise of comparable power plants. The new diesel, which also had a respectable power output of 53 kW (72 hp) and low fuel consumption, proved to be a highly successful innovation and was soon in high demand. A total of 463,366 units of the 190 D were built over the ten years it remained in production. In 1984 the new 190 E 2.3-16 made its debut at the top end of the model series. Even in appearance, the new model was very different, with a clear profile as a compact sports car highlighted by features such as the wing-type spoiler at the rear. For the engine, the company’s engineers went back to the W 123 series. The four-cylinder engine with 2,299-cc displacement as used in the 190 E 2.3-16 had a newly designed cylinder head with two intake and two exhaust valves. These and other modifications boosted engine power from 100 kW (136 hp) to 136 kW (185 hp), with acceleration from standstill to 100 km/h in just 7.5 seconds. The car’s top speed was 230 km/h. The 190 E 2.3-16 had been able to show what it could do as early as in 1983 the year of its presentation at the Frankfurt International Motor Show. Four weeks before the launch, three prototypes of the model had set several world long-distance records over 25,000 kilometres, 25,000 miles, and 50,000 kilometres, with average speeds of almost 250 km/h, in Nardo, southern Italy. These results were a foretaste of the 190’s subsequent career as a sports car. 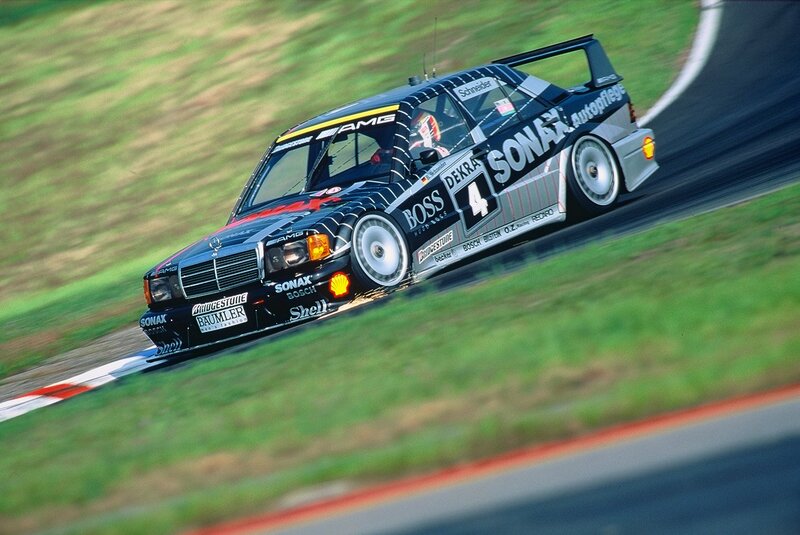 The new Mercedes-Benz racing car made its debut in the official opening race on the new Nürburgring on May 12, 1984. The road-going version of the 16-valve model went into production in September 1984, in two metallic finishes: blue black and smoke silver. Two more compact class models came in 1983 for export to North America only. These US versions were the diesel-engined 190 D 2.2 and petrol-engined 190 E 2.3. For the diesel version, the displacement volume was increased to 2197 cc by lengthening the stroke. This compensated for the loss in power resulting from the fitting of an exhaust gas recirculation (EGR) system. This feature was essential for a car exported to the US, particularly in view of the stringent emission limits in California. The modified diesel engine delivered 54 kW (73 hp), practically the same as in the standard version. The closed-loop emission control system initially made the petrol-engined 190 E 2.3 significantly less powerful than the 230 E (W 123). The rating of 83 kW (113 hp) instead of 100 kW (136 hp) put the larger-displacement export version even below the standard 190 E. This problem was solved in 1984 with a modified intake manifold, a redesigned camshaft and a newly tuned injection system. The 190 E 2.3 now delivered 90 kW (122 hp), on a par with the two-litre model. The 190’s engine with carburettor had its performance boosted just two years after being launched into the market. The derated version was replaced with an engine without any performance restrictions, and the Mercedes-Benz design engineers also raised the compression ratio. The basic model of the series, internally known as the 190/1, now delivered 77 kW (105 hp), an increase of 11 kW (15 hp). The more effective exhaust silencers were the only thing that prevented the engine from matching the output of its W 123 counterpart. The refinement package for the 190 and 190 E included single-belt drive, hydraulic valve clearance compensation and hydraulic engine bearings. At the time of the market launch of the new mid-sized W 124 series in January 1985, the specifications of the compact class were extended by the addition of 15-inch wheels, electrically heated windshield wiper nozzles and an eccentric-sweep windshield wiper with a significantly larger swept area. From September 1985, power steering and electrically heated exterior mirrors were fitted as standard on all models. 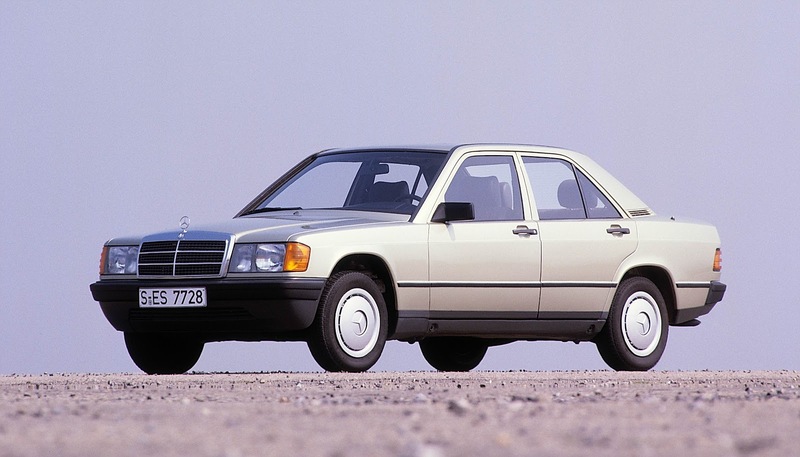 But as well as introducing technical improvements to the compact class, the arrival of the mid-series W 124 also changed perceptions of the 190. The latter had previously been stylistically completely distinct from the profile of other Mercedes-Benz models, but the introduction of the W 124 series with features consistent with the brand profile made it quite clear that the compact model series had become the trendsetter for a new design language of Mercedes-Benz cars. Mercedes-Benz added two new models to the series in 1985, starting with the 190 D 2.5, a Saloon powered by the five-cylinder diesel engine from the 250 D, with a displacement of 2497 cc and output of 66 kW (90 hp). As well as providing the same impressive fuel economy as the 190 D, the compact diesel also had impressive performance and a top speed of 174 km/h. The follow-up to the five-cylinder diesel engine came in the fall of 1985 when Mercedes-Benz actually installed a six-cylinder in-line engine in the 190. 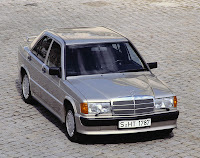 The Stuttgart brand displayed the 190 E 2.6 at the Frankfurt International Motor Show in September of that year. In combination with a five-speed manual transmission, the 2566-cc engine delivered 122 kW (166 hp) and accelerated the car from standstill to 100 km/h in just 8.2 seconds. The top speed was 215 km/h. Visitors to the motor show were impressed by the design skills employed to fit a large six-cylinder engine into the limited space available under the hood of the 190. The Mercedes-Benz engineers had come up with a masterpiece of made-to-measure automotive packaging. The external indications of the higher power of the 190 E 2.6 were twin exhaust pipes and the deeper and more steeply angled front apron with wider louvers. Just a few weeks after the 190 E 2.6 had made its debut, the 500,000th 190 rolled off the assembly line. The new model with petrol injection engine had not yet contributed to this milestone. Production of the 190 E 2.6 started in April 1986, and the new model was finally launched into the market in October 1986, together with the 190 E 2.3. The main difference between this variant of the W 201 series and the export version of the same name was the four-cylinder engine with normal compression ratio and a power output of 100 kW (136 hp). From that time, all petrol-engined models were available with the option of a closed-loop emission control system with a three-way catalytic converter, except for the 190 with carburettor. As an alternative option, Mercedes-Benz also offered cars which were prepared for retrofitting, with a multi-functional mixture preparation and ignition system, but without catalytic converter or lambda sensor. Older cars could also easily be retrofitted with the closed-loop catalytic converter. These alternatives gave vehicle owners the flexibility to decide when to switch to a closed-loop emission control system. From September 1986, the carburettor model was also available with an emission control system, and the closed-loop catalytic converter became standard equipment on all petrol-engined Mercedes-Benz passenger car models. Cars prepared for retrofitting were still available on request until August 1989, at a lower price than the equivalent version with catalytic converter. 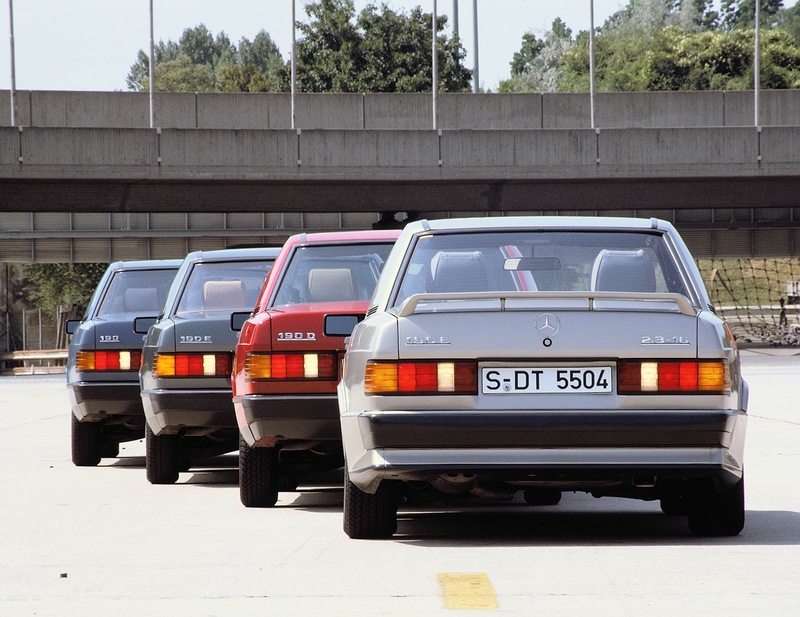 In 1987, the compact class continued on its course towards diesel cars with sporty performance. In September of that year, Mercedes-Benz presented the 190 D 2.5 Turbo at the Frankfurt International Motor Show. The engine was a 90 kW (122 hp) five-cylinder turbodiesel compression-ignition unit, derived from the proven naturally aspirated engine. The exhaust-gas turbocharger boosted power by 24 kW (32 hp), resulting in a top speed of 192 km/h and acceleration from standstill to 100 km/h in 11.5 seconds. The visual trademark of the new model, exported to the USA from as early as fall 1986, was the six louvers in the front right fender, between direction indicator and wheel cut-out. These were not a decorative feature with martial connotations, but were vital in supplying the turbocharger with the amount of air it required. Another difference between the turbodiesel and its sister model with naturally aspirated engine was the twin-pipe rear silencer. The one-millionth W 201 rolled off the assembly line in Bremen in March 1988. By now, the compact class had established itself as Mercedes-Benz’s third major model series. 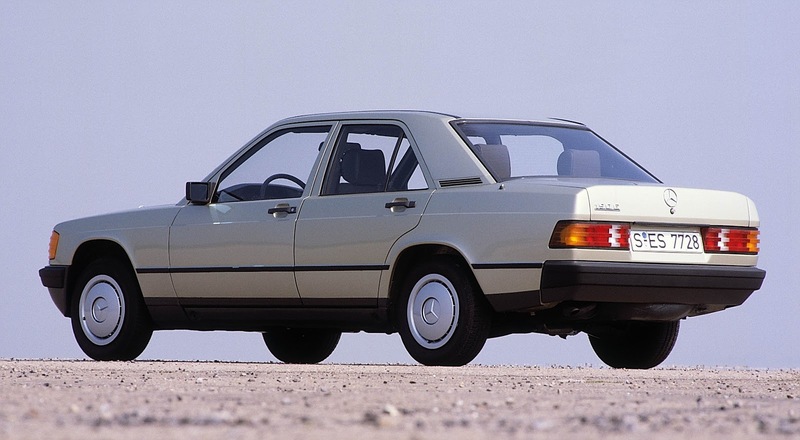 The company also fundamentally revised the 190 in 1988. The refined compact class was unveiled at the Paris Motor Show in September 1988, six years after the presentation of the first 190. The main focus was on the restyling of the body and the new-look interior. The most striking feature of the refined models was the protective side strips with integrated side skirt panelling, similar to those in the Coupés from the 124 model series. The front and rear spoilers reached further down and were combined with larger bumpers, with new support elements and modified impact absorbers designed for increased energy absorption. The new front apron had been adopted from the 190 E 2.6 and was now used on all models to reduce the lift at the front axle. The purpose of new spoiler at the rear was to optimize the airflow outflow. The refinement package also included the nearside exterior mirror as part of the standard equipment. The new interior design made the 190 more spacious and more comfortable for both driver and occupants, with more knee and head room in the rear and improved seats at both front and rear. 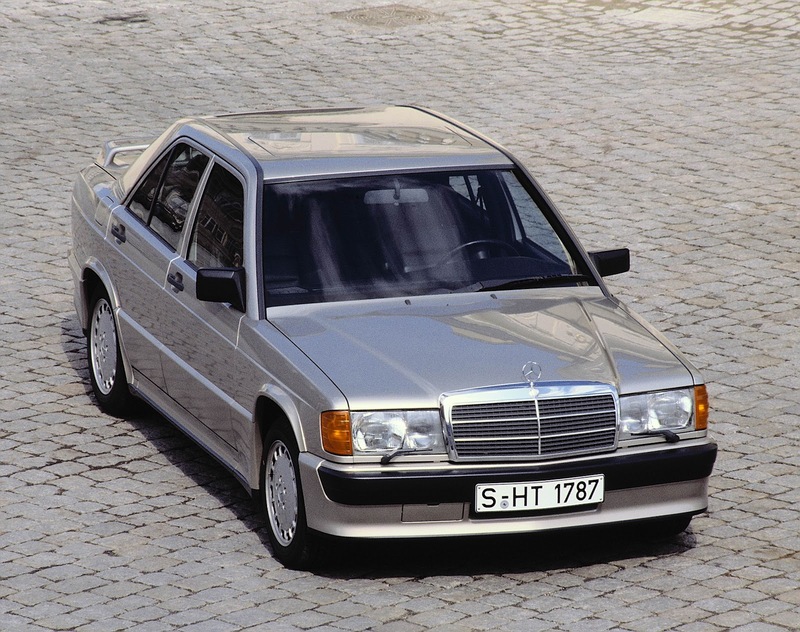 Simultaneously with the refinement, Mercedes-Benz also introduced its new top-of-range model for the compact class: the 190 E 2.5-16, replacing the first 16-valve engine with a 2.3-liter unit after four years. The engine was actually based on its predecessor, benefiting from a longer stroke. The new engine, with catalytic converter, developed 143 kW (195 hp) – 18 kW (25 hp) more than its predecessor. 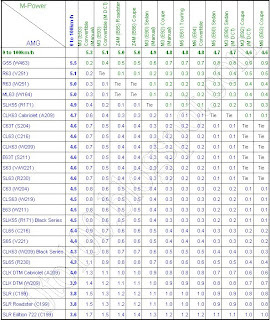 Even with the catalytic converter, the performance of the new model matched the 190 E 2.3-16 without emission control system. The new 16-valve model was also identified as a descendant of the Nardo record car by its visual appearance. Two new paint finishes were now available, complementing the blue black and smoke silver finishes by the addition of the metallic finishes almandine red and astral silver. 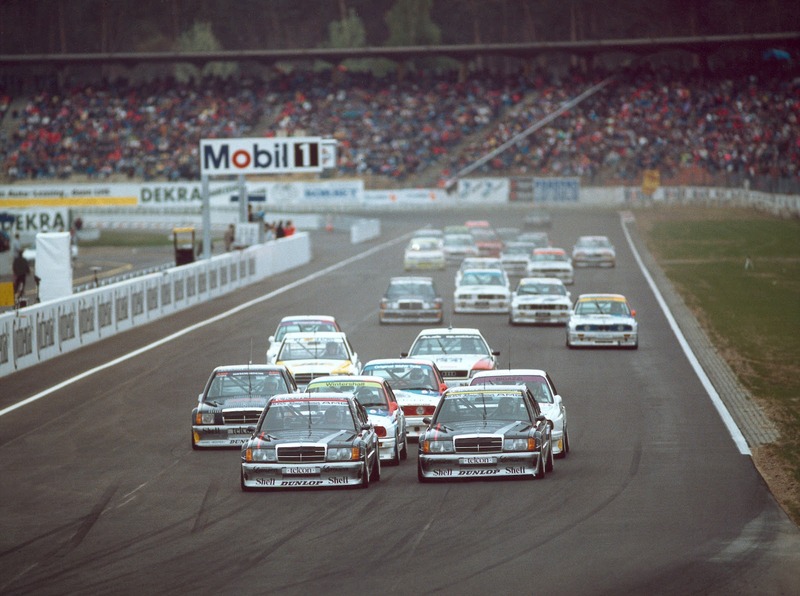 The 190 E 2.5-16 also became the basis for the sports cars entered in Group A of the German Touring Car Championship (DTM). The type-approved base model was the Mercedes-Benz 190 E 2.5-16 Evolution with the M 102 E 25/2 engine, further modified for racing. The next development stage came one year later with the 190 E 2.5-16 Evolution II model. In its production version, this car, again presented for the first time at the Geneva Motor Show, delivered 173 kW (235 hp), with performance boosted still further. 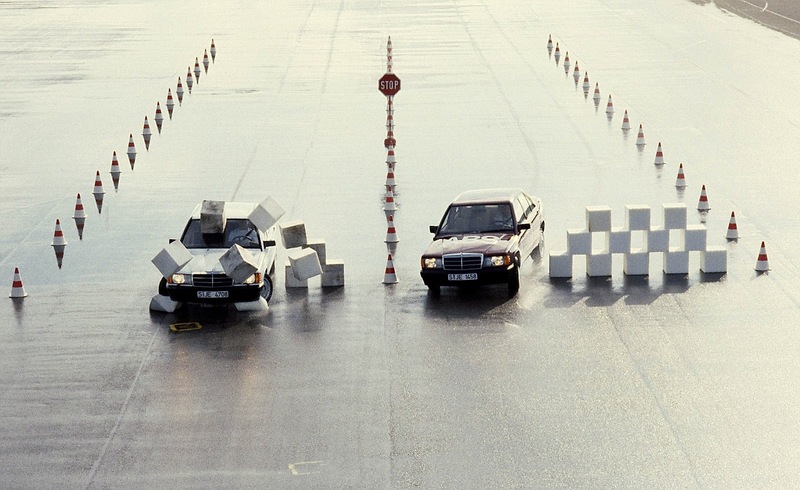 From February 1989, in the context of the “Diesel ‘89” initiative, Mercedes-Benz started fitting all its diesel-engined passenger car models with reworked engines with particulate emissions reduced by 40 percent through optimization of the combustion cycle. The optimized diesel models were virtually smoke-free and met the stringent particulate emissions limits in the U.S.A. even without a particulate trap. This was made possible by newly designed prechamber combustion with oblique fuel injection for more efficient combustion. The injection pumps in all naturally aspirated diesel engines now also had an altitude correction unit (vacuum cell) to keep emissions down even when driving at high altitudes. A favourable side effect of the new diesel technology was a power increase of 2 kW (3 hp) in the 190 D and 3 kW (4 hp) in the 190 D 2.5. From as early as September 1988, cars with turbocharged diesel engines were fitted with comparable technology – which meant that the output of the 190 D 2.5 Turbo was boosted to 93 kW (126 hp). A sophisticated emission control system introduced in 1990 further reduced pollutant emission levels. To achieve this, Mercedes-Benz opted for an oxidation catalyst specially developed for diesel engines and combined with an exhaust gas recirculation system. This highly efficient system was available as optional equipment from October 1990, initially for cars with naturally aspirated diesel engines, then six months later for turbocharged models as well. The Sportline package, a new equipment variant for the 190, came onto the market in June 1989. The package was available for all models and featured a suspension lowered by 21 mm, tauter springs and shock absorbers, 7J x 15 alloy wheels with wide tires in 205/55 R 15 format, and seating as in the 16-valve model. This did not apply to the 190 E 2.5-16 which already boasted sporty equipment in its standard version. The era of petrol engines with carburettors at Mercedes-Benz ended in 1990. In the case of the W 201 model series, this meant that the 190 E 1.8 model replaced the 190 that had been in production for over seven years. The new engine had a displacement of 1,797 cubic centimetres and delivered 80 kW (109 hp) with catalytic converter. It had been derived from the two-litre engine in the 190 E by reducing the stroke, and used the same mechanically/electronically controlled Bosch KE-Jetronic injection system. The 190 was refined for the last time in 1991. Among other things, all series variants now featured the ABS anti-lock braking system, except for the 190 D and 190 E 1.8 entry-level models. The 190 E was now called the 190 E 2.0, and was 3 kW (4 hp) more powerful, thanks to a lower-resistance exhaust system. Mercedes-Benz presented another three special models of the W 201 in 1992, the last full year of production of the series. These AVANTGARDE versions of the 190 E 1.8, 190 E 2.3 and 190 D 2.5 were primarily designed to have a more youthful look, including pearl coat finishes in strong colours. In all, 4,600 units were built of these special models. Production of the 190 model ended in Sindelfingen in February 1993 and in Bremen in August that same year. A total of 1,879,630 vehicles had been manufactured. This underlines the success of the compact class, and the wisdom of the decision to extend the product range of the Mercedes-Benz brand into lower segments of the market. auto, motor und sport, January 12, 1983, on the public reaction to the W 201: “No other car is so much at the centre of attention, no other car has generated anything like the curiosity as this new development from the world’s oldest motor manufacturer."